I used to hate Cream of Whatever soup and would almost never use it. But y'all. Y'all! They have come a LONG way with them in the last few years. One night I was staring at the pantry trying to figure out something quick and easy to throw together for supper when I spied a can of Cream of Mushroom and a bag of egg noodles and thought... meh, why not? 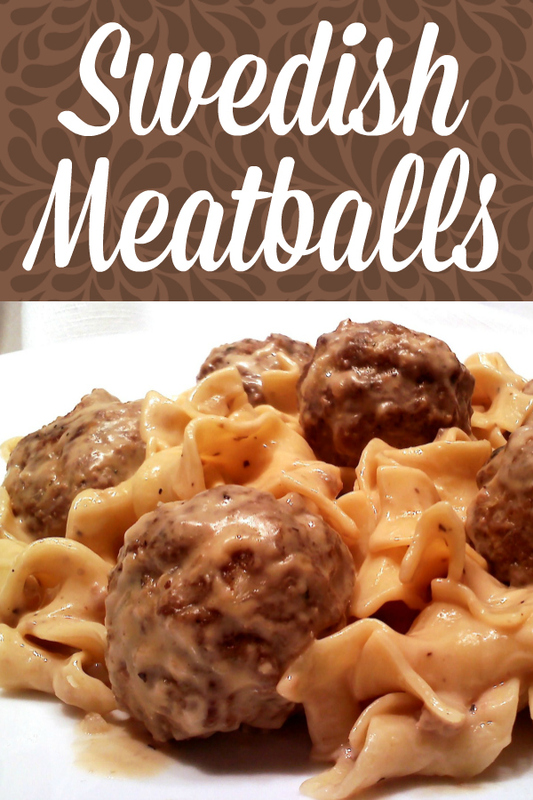 I won’t say this recipe is an authentic, made from scratch, Swedish Meatball recipe (like you would get IN Sweden) but you know what? Dadgoneit if it's not delicious! Oh, and if your crew doesn't like mushrooms, I PROMISE they will not be put off by the soup. If Husband or Brutus knew there were mushroom bits in there they'd boycott supper but neither of them has ever had a clue when I make this! Put this in your weeknight supper rotation. You'll be glad you did! In a medium-sized saucepan add one envelope brown gravy mix. Whisk in water then heat pan over medium-high heat. Heat and whisk until gravy starts to boil. Add mushroom soup, salt and pepper; stir until completely incorporated. Add sour cream, stir well, reduce heat to low and cover until ready to use. 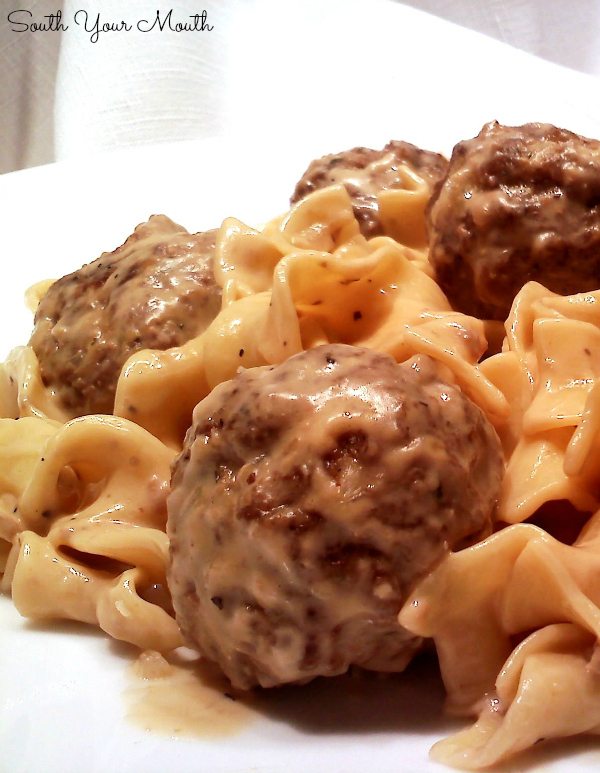 In a large bowl, combine meatballs, sauce mixture and cooked noodles. Gently stir until all ingredients are combined then serve. 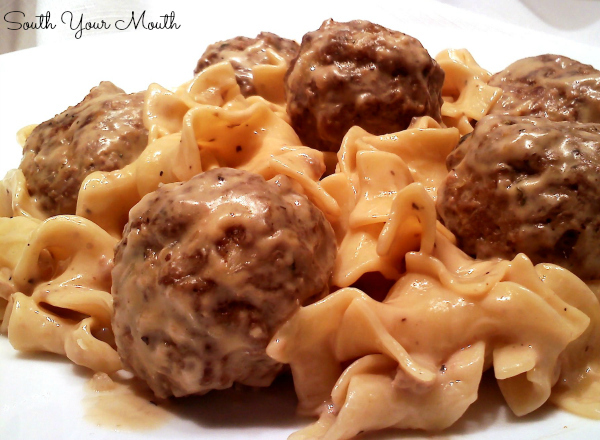 *If using frozen meatballs, defrost meatballs then heat them in the sauce before mixing with the noodles. These look REALLY good good good! Thanks so much for sharing at Weekend Potluck. Just made these. They are sooooooooooo good! made them for supper ~ delish!! Any idea how many servings this makes? I have a family of six. Just wondering if I would need to double it or not. Looks super yummy! Use Beefy Mushroom so much better! This will for sure be in dinner rotation for the month. THANKS! 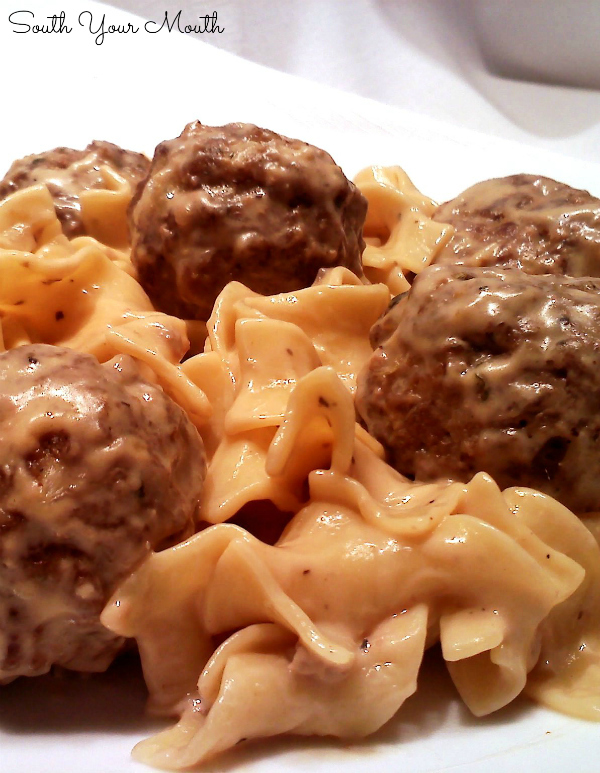 Perfect, but to be Swedish and using pre-made meatballs, how about adding a little nutmeg to the GRAVY?? Great recipe! i added nutmeg and used cream of celery instead and a bay leaf. im actually impressed w myself. 1st time making these and I like my recipes taste better than IKEA...lol. Need some lingonberry though...or whatever its called. 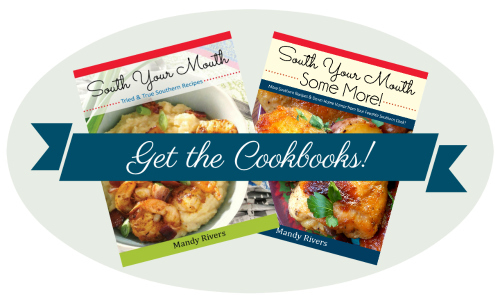 But this recipe did help me establish the foundation. I don't like mushrooms so I use cream of onion soup and 2 gravy packets for more beef flavoring.